Born in Sagua la Grande, Cuba, Wilfredo Lam personally exemplified the complex multiethnic nature of Latin America: his father was Chinese while his mother boasted a combined African, Indian, and European cultural background. Utilizing some of this background, Lam, through art, would explore various African and Caribbean cultural themes and exhibit his art both in the United States and in Europe. Already at an early age, Wilfredo’s talents as an artist were becoming recognized. By the age of 14, he had enrolled at Havana’s fine arts institution, Escuela de Bellas Artes. Two years later his work began to come into the public eye through the various exhibitions initiated by Havana’s sculptor and painters association. During this time, Lam primarily worked in still life and landscapes. By 1923, Lam had decided to further his arts education in Europe, traveling to Spain and becoming a student of Salvador Dali’s former instructor, Fernando Alvarez de Sotomayor. During his fifteen year stay in Spain, Lam visited various parts of the Spanish peninsula and experimented in various genres from cubism to surrealism. Influences included the French painter Henry Matisse and Spain’s Pablo Picasso. The latter would help shape both Lam’s artistic work and political leanings, and would be responsible for encouraging Lam’s interest in African art and tribal masks. With the advent of civil war in Spain, Lam sought to fight on the Republican side but eventually left the country by 1938. Upon arriving in Paris that same year, Lam was introduced to the city’s art community and was invited to display his work at a solo show at the Galerie Pierre Loeb. His stay in France, however, was cut short with the arrival of Nazi troops and World War II. His departure was part of a larger exodus of artists and intellectuals to the island of Martinique. 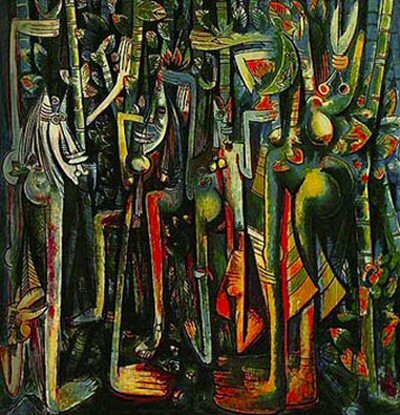 The subsequent move back to the Caribbean initiated a rediscovery of Lam’s Afro-Cuban background of which his 1943 painting, La Jungla, exemplifies. With its mixed sensibilities, Lam’s La Jungla and later work documented and expressed Cuban landscapes, African mythologies, and Caribbean spirit. He celebrated his first solo show in Havana in 1946 and won a national prize in 1951. After 1946, his paintings took on a more solemn tone as demonstrated in La Boda (1976) and are most attributed to his interest in the hybrid Haitian religion of Santeria. Lam continued his travels through the 1950s and 60s, finally settling in Europe and establishing a studio in Italy. Featured in both in the Americas and European continent, Lam’s works have won numerous awards and drawn acclaim for its bold and striking features. He died on September 11, 1982 in Paris. Karen Juanita Carrillo, “Cuba Celebrates Birth of Wilfredo Lam,” New York Amsterdam News 98:51 (Dec. 2007); Lowery Stokes Sims, Wilfredo Lam and the International Avant-garde, 1923-1982 (Austin: University of Texas Press, 2002); http://www.cubanet.org.